Swim with the manatees in their natural environment and see wildlife up close at several state parks with a visit to Crystal River on Florida’s Nature Coast. Florida’s Nature Coast lies 95 miles northwest of Orlando, a short hour and a half drive. From swimming with the manatees in the winter months to scalloping in the summer and early fall, Crystal River gives visitors plenty of opportunities to explore unspoiled Florida at its finest. This eco-tourism destination is quickly becoming a place where people around the country, and even around the world, come to see wildlife up close while learning about what they can do to protect the animals and maintain their homes. Before you head out to play, drop off your bags at Plantation on Crystal River, a 50-year-old resort that is located close to many state parks and tasty restaurants and is surrounded by the beauty of Kings Bay. Comfy accommodations with décor that mimics the natural landscape of the Nature Coast will make you feel right at home. Relaxing on-property experiences include services at Spa Bleu and a meal overlooking the water at West 82° Grill. 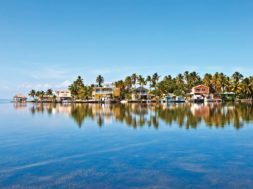 Crystal River is one of two places in the world (and the only place in North America) where you can legally swim with the West Indian manatee; the other is Belize. The warm waters of the area’s surrounding springs become a sanctuary for manatees from around Nov. 15 to March 31 each year as they migrate south to escape the chilly temperatures. The air may be cold during your manatee swim experience, but the water in the springs remains relatively warm, ranging from 68 degrees to 74 degrees. It’s important to note that since manatees are an endangered species, tours are meant for passive observation only, especially when the manatees are resting at the bottom. That doesn’t mean these playful creatures won’t swim straight up to you and give you a smooch right on your goggles or roll over for a belly rub. In that case, when the manatee initiates contact, you are allowed to play along. Tour guides will give you all the details about the dos and don’ts of swimming with the manatees so you can be sure you’re following all state laws meant to protect the animals. 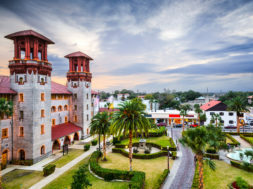 While there are many tour companies in the area, a stay at Plantation on Crystal River will put you right in the thick of it. Manatee tours run out of the on-site Plantation Adventure Center, where expert guides will help you maneuver through the springs to the best manatee viewing spots. Swimming with the manatees is a sought-after experience in Crystal River, but there is even more to do while you’re there. Hop on a trolley at the Visit Citrus Welcome Center for a ride to Three Sisters Springs Wildlife Refuge where you can meander along the boardwalk for a view of the crystal-clear springs and its inhabitants. 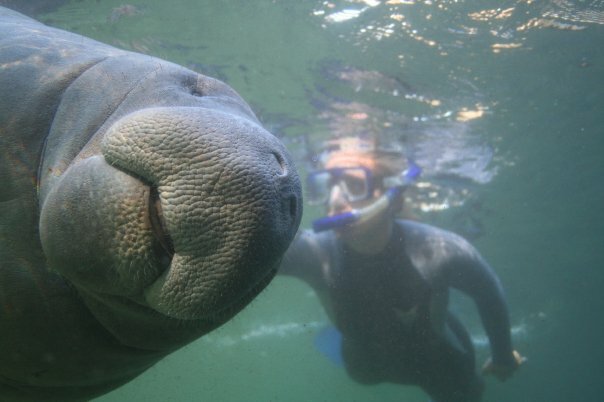 You will also get to see manatee swim tours in action from above. Three Sisters Springs consists of vents, sand boils and clear water that feed Kings Bay, which are headwaters of the Crystal River. It is here that hundreds of manatees seek refuge during the winter. Since this area is a wildlife refuge, there is no public parking and the trolley is the best way to get to the property. A bit farther down U.S. 19 is Ellie Schiller Homosassa Springs Wildlife State Park. Park at the visitor center and then take a scenic boat ride down Pepper Creek or a tram ride through the woods to get to the animal viewing areas. Educational programs focusing on manatees, alligators and even hippos take place throughout the day, and recreational opportunities include picnicking and bird watching. Traverse the small boardwalk to view black bears, bobcats, white-tailed deer, river otters and other animals. You’re sure to work up an appetite during your outdoor adventures. 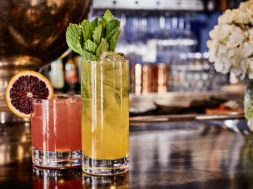 For lighter fare and a cold beverage, stop at Tea House 650 in the downtown area. Serving sandwiches, flatbreads and homemade scones for a snack and smoothies, wine and a large variety of cold and hot tea to wash it down, all in a quaint shop that was restored from an old home, Tea House is the perfect pit stop on a day of sightseeing. The Wild Sassa Food Trailer, located at Shelly’s Seafood Market in neighboring Homosassa, provides a taste of the area’s bounty. You can have shrimp or fish tacos for lunch and grab some fresh mullet, ocean scallops or fresh stone crab to bring home with you. Whether you decide to swim with the manatees, park hop in a whole new way at the area’s many state parks, or all of the above, Crystal River provides an easy, not so out-of-the-way weekend adventure that the whole family will love.